On the couch sits a man who is excited about everything. Surely it cannot be genuine, let alone healthy. How does he do it, and what is he hiding? “I’ve never experienced the feeling which some people have that there’s nothing to do,” says Unne Sormunen, the recently-appointed CEO of the production company EndemolShine Finland. He talks for two hours about his career and his Aalto MBA studies, and suggests you try mate tea, which according to him fills you with energy. Radio, television and sports. These are the keywords to use when you want to find information about Sormunen. At our meeting, the picture of the man broadens, but traditional broadcast media and sports, especially ice hockey, stay in it for a good while. Sormunen comes from Lahti. Following in his fathers footsteps, he started training karate at the age of seven. Later on, ice hockey entered the scene in a big way, and eventually he reached the post of team captain with the Pelicans’ under-19s. He’s not all praise for his time in ice hockey, however. He says he stopped training after the overbearing macho culture and brashness that comes with the sport became too much for him. In the same breath, he is quick to commend the way ice hockey clubs are currently run. We’re too easily compartmentalizing people and making them one-dimensional. This is a big mistake." After his matriculation examination, he left Lahti and moved to the Helsinki area. He took a journalism course at the Laajasalon Opisto institute, and says he tried to do as much as possible, as well as possible. This started him on a journey of rapid advancement. He rattles off a list of his previous jobs, and never fails to mention several people whom he is grateful to. He started off as a sports reporter for Yleisradio, then he went to Radio City, followed by four years as program manager for The Voice channel, which allowed him to get fully involved with TV work. His next employment was with MTV, working as a sports producer responsible for World Championships. After two years at MTV, he moved to Nelonen at Sanoma to work as an executive producer, and was quickly promoted to manager of domestic programming. For over four years, he was responsible for program acquisition for Nelonen in TV entertainment, dramas and films. His wife is actually the heroine in this story. She has encouraged him and pushed him forward at every turning point of his career and life. Sormunen mentions his wife on several occasions, and says that without her support things would probably look very different. They’ve managed to negotiate their demanding jobs, hobbies, business trips and even a two-year course in good understanding. The couple were able to go on their honeymoon at the turn of the year, four years late. Just before their departure, he signed a contract with the production company EndemolShine Finland and left his job at Sanoma. EndemolShine Finland produces, for example, the Finnish versions of Gogglebox, Married At First Sight, and Ready Steady Cook. He heads the Finnish branch of a large international production company, has seven permanent employees and roughly one hundred freelancers. Let’s go back a couple of years to an important moment. It was time to study. Sormunen completed the Aalto MBA program in 2017-2018 and graduated just before the end of the year, incidentally on the same day as the new employment contract was signed and the honeymoon began. In addition to studying for the MBA alongside demanding work, there was quite a calendar puzzle to solve. What can you compromise on in a situation like that? You couldn’t hang out with your friends as much as before, and the one-hour jog was shortened by half. But often in the early morning, he would sneak off to the Tali golf course with his gear while his wife was still sleeping. But do you have to be a Superman of enthusiasm and a scheduling master to be able to study and work at the same time? Sormunen says you don’t, but you do have to conduct all the necessary conversations carefully. Having one discussion with your family and another in the workplace lay an important foundation which allows you to fully engage with your studies. Now, Sormunen is learning something new again. At work, he sits in the EndemoShine Nordic executive team, his own boss is in Stockholm, he’s sometimes negotiating with people from his former employers sitting on the other side of the table, the industry is developing at a rapid pace, and in addition to his subordinates, he is responsible for a turnover of ten million euros. At the end of the interview, Sormunen announces he plans to change the TV industry in Finland. Yes, his enthusiasm seems real, and it’s also clearly contagious. Aalto MBA is a life-changing general management program for talented people who want to broaden their career prospects and challenge themselves in an innovative way. Read more about the program. 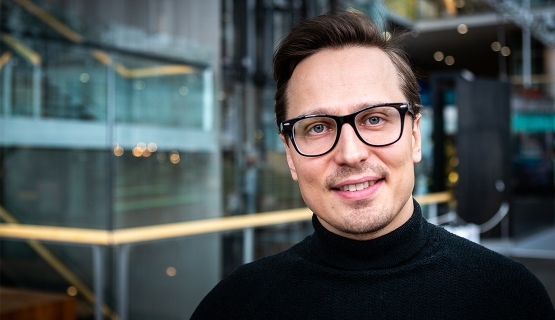 MBA is an opportunity to reinvent yourselfAalto EE alumni Tuomas Laakso describes how he managed to reach his professional dreams through studies.